A while ago I filled up my final unused memory slot in my awesome Mac Pro with an additional 4 gigorams (for a grand total of 16). 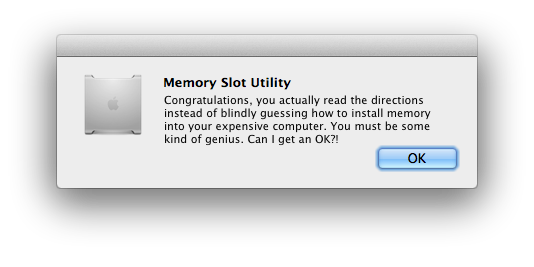 Since then, whenever I reboot I’m showered with praise by the Memory Slot Utility for a job well done. This made me feel pretty good for the first couple months, but eventually it got old and I was ready to say goodbye for the last time. Googling around, I found the usual colorful variety of suggestions, ranging from “do a permissions repair” to “reinstall Mac OS X” to “reformat your hard drive”. Manual invocations of Memory Slot Utility as root (e.g. sudo open -a Memory\ Slot\ Utility.app) didn’t help, although it was obvious that it needed to twiddle some bit somewhere, and my hunch was that this was most likely failing for authorization reasons. The winning move turned out to be logging in briefly as root. Generally not a good idea to log in as root, but in this case it’s the easiest way to clear this condition. All you need to do is enable the root account by setting a password for it, and then log in as root from the login window. In the CoreServices folder, open Directory Utility. From the Edit menu, choose “Enable Root User”, and supply a password. Open System Preferences –> Users & Groups prefpane, and under Login Options, turn off Automatic Login, and set the login window display to Name and password. Reboot. Log in as root from the login window. Perform one final heroic click of Memory Slot Utility’s OK button, going for maximum style points. Log out, log back in as yourself, put settings back the way you like them. I suggest using Directory Utility to disable the root account. This entry was posted in mac pro, OS X, Pro Tip, The More You Know. Bookmark the permalink. Pingback: Silencing The Memory Slot Utility | Click & Find Answer !